Pattern Gauge: 25 sts = 7” 18 cm and 19 rows = 4” 10 cm in Cable Lace St patt on larger needle. Here’s a modern take on the twin set! 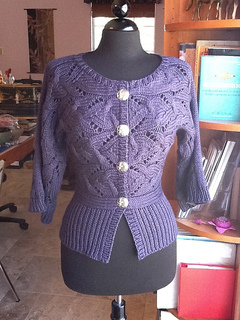 A kimono sleeve cardigan knit sideways and a matching cowl. 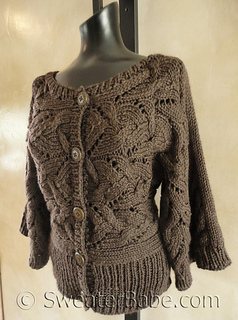 The cardigan is knit from the centers out to the ¾ length sleeves in four parts, so the kimono sleeves extend naturally from the body. 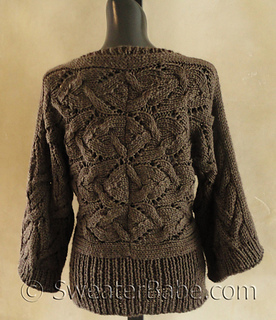 Ribbed waistband, cuffs, front bands, and collar are picked up and knit afterwards. 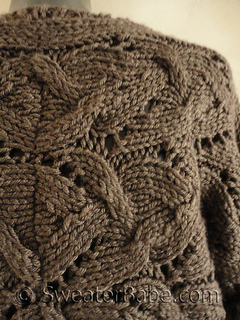 The beautiful cable and lace pattern stitch looks great running sideways. 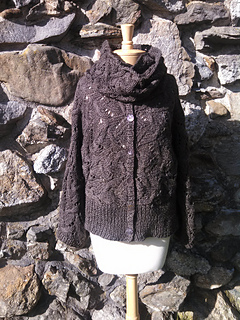 The cowl is knit separately, featuring the same gorgeously textured cable lace pattern stitch. Loop it twice around your neck for effortless chic. Looks great as a set or worn separately, as your mood and the weather dictates! The chocolate brown shade of this yarn, with its silk content, makes it a luxuriously yummy and very contemporary twin set! 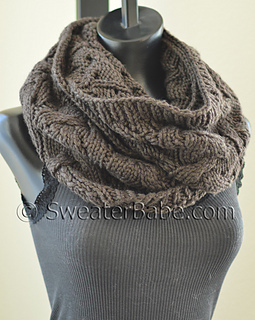 Cowl pattern can also be purchased separately. 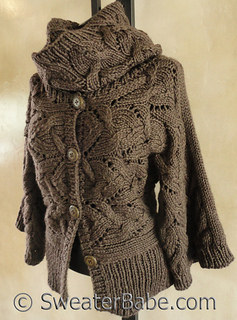 This pattern includes BOTH the Cowl and the Cardigan.